Who has released records on all these labels: the legendary R&B label OKeh, the nu-blues stronghold Fat Possum, the key rap originators Sugar Hill, Tommy Boy and 4th & Broadway, the innovative On-U Sound, and of course Real World Records? Which musician has played on records by Grandmaster Flash, Afrika Bambaata, Lee ‘Scratch’ Perry, James Brown, Robert Plant, Mark Stewart & The Mafia, Sinead O’Connor, and Megadeth? The answer to both questions is Skip McDonald, and Skip is Little Axe. 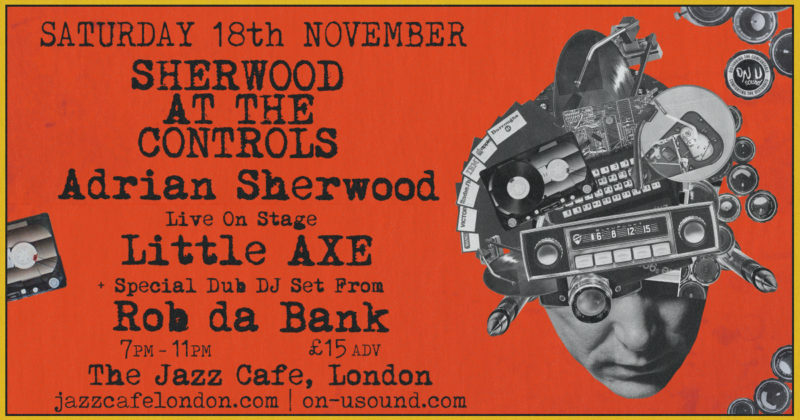 With a relationship going back to the early noughties with Adrian Sherwood’s On-U Sound label, it makes perfect sense to invite him down for the next edition of our Sherwood At The Controls series. To mark the occasion, Rob da Bank will also be performing a special one-off dub set. With all of our previous Sherwood shows being sell outs, this is bound to be no different – jump to it. Tickets available direct from The Jazz Cafe here!